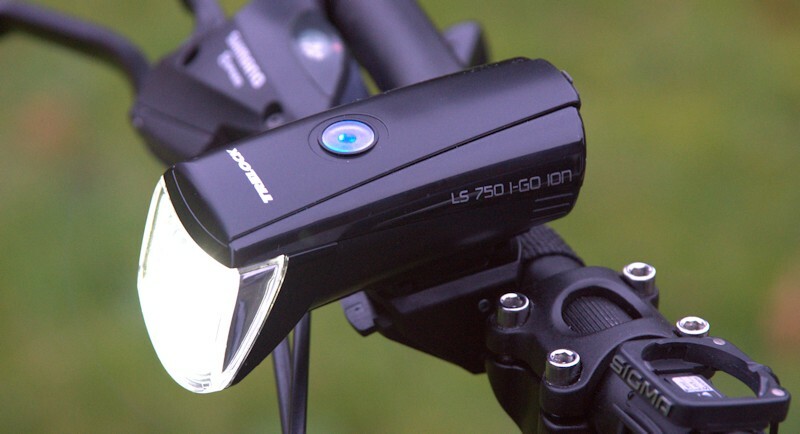 In this article, the bicycle lamp LS 750 I-GO ION from Trelock’s protagonist and is tested through its paces. The battery bicycle lamp is examined on the practicality, the luminous intensity, the weight, the mounting on the bicycle and processing.Interestingly should the test for all his, between the model Trelock LS 950 ION want to decide and the model Trelock LS 750 ION. This bike lamp has a FR approvals and should be officially used in road transport. Keeping the bicycle lamp in hand, one has a feeling valent. The size and weight are a good match and the processing of each part looks very high. There are no sharp edges or corners on the air. The bicycle headlight itself is black and has only in the headlamp lens and the mirror of a different color. On top of the lamp is the button with the one the Trelock LS 750 ION Controls. This button has a diameter of about 12 mm and can be operated well even with large fingers. 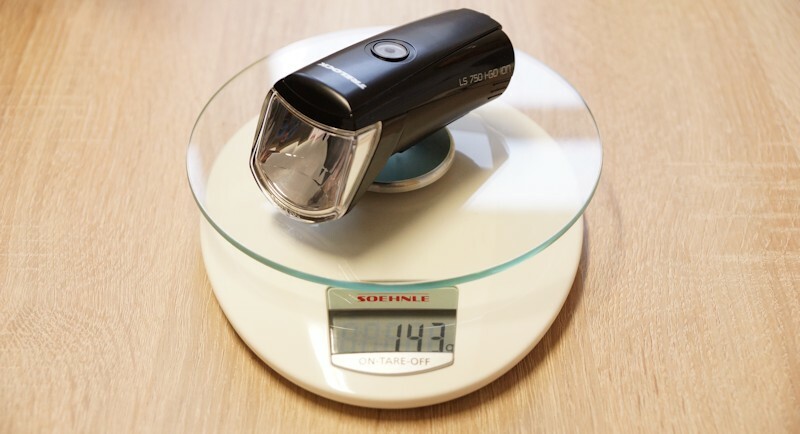 The weight of the headlights was determined by us with 143 grams. To turn on the headlights have to hold the button about 1-2 seconds. Now begins this to glow and burn the lamp LED. The headlamp starts directly in the highest luminous level and the button remains lit blue. You push once to this, it changes color to green and the bike lamp reduces the light intensity a little. In the strongest level one has a light intensity of approximately 30 LUX which is sufficient for the normal city traffic. This button is also the status display for the battery charge level. Loses the battery to charge, so the color change to red. The battery bicycle lamp is charged through a built-MINI-USB connector. Given away to a protective rubber plug at the rear of the bicycle lamp and discovered here under the charging socket. At this point of reference, the rubber lip is very difficult to remove in our test model, because the rubber flap is a little short. With cold fingers or larger fingers for us was folding away the rubber lip a little fiddly job. Whether this is in all models so or it was only the case with our test model, we can not say unfortunately. In the ratings of some shops but by this effect nothing to read. If one has the rubber flap away, so you can connect the included USB cable and the battery light Trelock LS recharge 750th During the state of charge of the power button flashes green.If the lamp is fully charged, the flashing stops and the button is solid green. Now you can remove the battery lamp back from the cable, close the rubber cap and use the bicycle. Is integrated in the Trelock LS 750 ION a lithium-ion battery with 3.6 V and 1.0 watts of power, according inlaying on the bicycle headlights. The built-in lithium ion battery lasts up to 7 hours and can quickly be fully recharged within a few hours. Whotravels with the bike to work and there is the possibility to load the lamp, this creates problems within one working day. In our test we let the bike run on headlamps strongest level (30 LUX) and were able to achieve a burn time of 16 hours. We have to run to the strongest level in two intervals the air. The manufacturer’s specification was 10 hours to the strongest level. The charging function via USB port and the integrated battery score. Keep your mind when stocking up on batteries to load regardless of the specific charger for AA cells and virtually any USB port. The annoying replacing or removing the batteries also omitted, overall this is very comfortable. The bracket on the bicycle is kept quite simple, with a small strap and a plastic holder can bicycle lamp Trelock mount on the handlebars. The battery lamp LS 750 ION is simply clipped into this bracket and can be quite easily released. To release there is a small lever on the air. This is held by a spring and can be pressed with a light pressure. The adjustment dissolves and the lamp can be removed. The bracket to the bicycle handlebar is largely responsible for the positioning of the bicycle lamp and the headlight. Depending on the inclination of the Trelock lamp seems more in the way in or right in front of the wheel. The width can not affect you and is critically dependent on the width of the light cone. The further you can radiate the light forward, the wider is the illuminated surface. As you can see on the manufacturers images Trelock are letting indicate the mount for cyclists. We show this away from the driver, it had to serh good advantage when removing the lamp there is a natural handle and you can include the wedge shape of the attachment so that the system moves directly to the solution button. The steering is not here in the way. In the end this is up to you, try it out. All told, by bicycle light Trelock LS 750 has fallen quite well with an integrated lithium-ion battery. The cultivation was pretty easy, even a layman can attach this lamp holder on the handlebar. The light intensity is sufficient with 30 LUX for the city. Depending on the setting you can before the bicycle illuminate quite a large field and sees obstacles in time. A couple of points could have been done better, so the fastening straps is to thickish pull this unaided by the clip (see video). Here the rubberized bottom acts directly as a slip-resistant. The rubber lip for the USB input could be provided with a slightly larger opening tab, it closes very well and is right in front of rainwater. Overall, the battery lamp Trelock has very confident in city traffic. From us gets the Trelock LS 750 I-Go ION 4.5 of 5 points and has thus achieved the test result «very good».